Well happy St. Patrick's Day everyone!!! How are you all planning on celebrating?? As I said in my other post, I don't really celebrate. This year I'll be at the parade, followed by an afternoon home enjoying the weather. Nice quiet day, who wouldn't enjoy that? So as I sit here watching The Black Donnelly's (thank you Netflix), I remembered I didn't post my second St. Patrick's Day mani yet! This show aired years ago on NBC for one season, and for some reason I liked it. When I saw it was on there, I took a break from watching Gossip Girl and Psych and started watching. Clearly, you can see I have the oddest taste in shows. Current favorite, Revenge. Anyone watched that??? Whew. This mani was a pain in the behind, but I think it turned out cute. I started with my green base coat. I then did the pots of gold. With a dotting tool and the black, i traced and filled in the little pot. Once dried, I took the white polish and dotted the gold coins. Once dried, I added the Milani gold, and bam they were done. Next, I went to do the rainbows. I started by putting the colors on with toothpicks. I started with red, then the orange, then the yello....uh oh, yellow doesn't show up well on green. Time to start over with the pointer finger. I didn't want to take off all the green on my other nails, or mess up my pots of gold with nail polish remover, so I took a white striper and outlined the rainbow on my nails. Carefully, and painstakingly, I filled in the area with the Sinful Colors Snow Me White. I then started stippling on the colors of the rainbow with a toothpick to each nail. 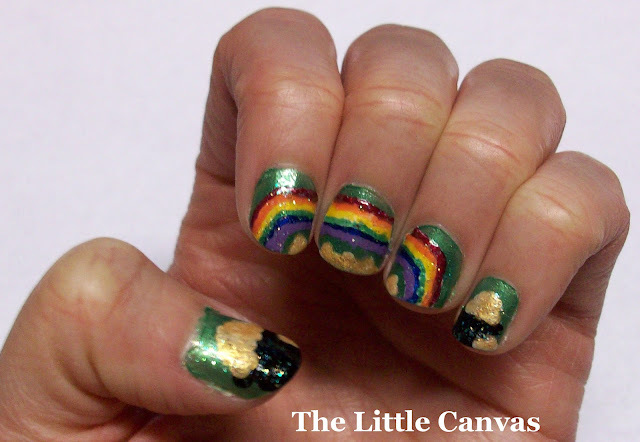 When the rainbows were done, I decided to add some gold coins to the rainbow fingers. I took the white and dotted some on, then topped it with the Milani. Finally, after an hour, it was all done. I slapped on a top coat of New York Colors White Lights Glitter to add just a little more, and bam, they were done. 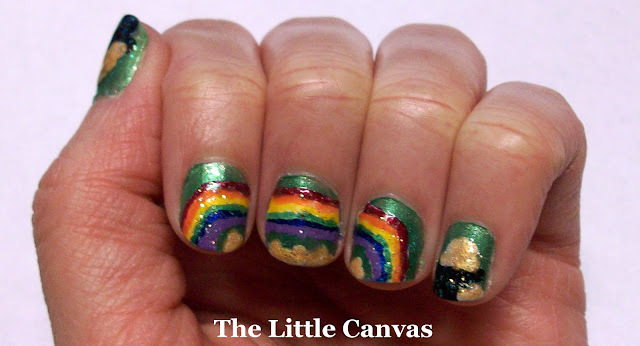 So, which St. Patrick's day mani did you like better, this one or my Leprechauns?